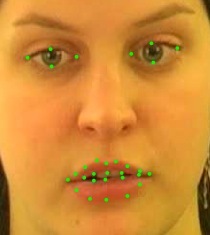 For automatic lipreading, there are many competing methods for feature extraction. Often, because of the complexity of the task these methods are tested on only quite restricted datasets, such as the letters of the alphabet or digits, and from only a few speakers. Here, we compare some of the leading methods for lip feature extraction and compare them on the GRID dataset. which uses a constrained vocabulary over, in this case, 15 speakers. 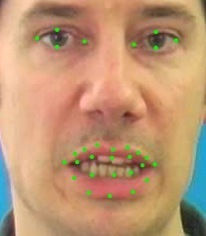 Previously the GRID dataset has had restricted attention because of the requirements to track the face and lips accurately. We overcome this via the use of a novel linear predictor (LP) tracker which we use to control an Active Appearance Model (AAM). Below are two examples of LP tracked landmarks on the GRID dataset. Visual features, such as sieve1d, eigen_lip, and 2DDCT are extracted from lip sub-images. Moreover, using the landmarks on the lips, we can remove affine variations by warping lip region to a reference shape. To test the robustness of the features across speakers, we designed a set of speaker independent experiments using a strategy of 15-fold cross-validation: for each fold, a different speaker is held-out for testing and the classifier is trained on the data of the remaining speakers. Subsequently, in each iteration, any features extracted with application of a PCA need to be recomputed. In the example of AAM, a new AAM model is trained on only the the training speakers during each iteration. 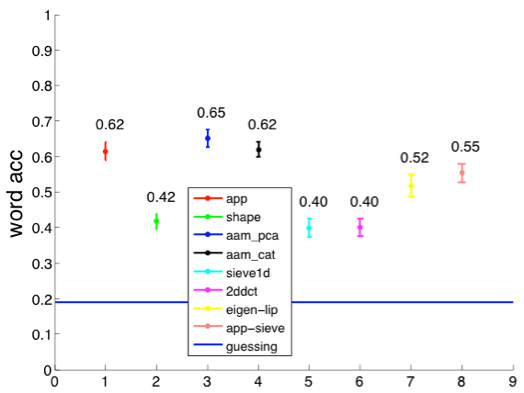 Results from the HMM classifier using the eight different visual features are plotted in the following figure.